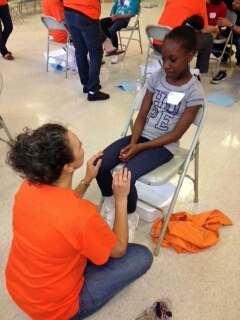 Samaritan’s Feet….Changing lives one pair of shoes at a time! Samaritan’s Feet volunteers & staff, Gaston County Commissioner, Tracy Philbeck and I washing feet and giving a new pair of shoes at Rhyne Elementary in Gastonia, Making Friends, one pair of shoes at a time! 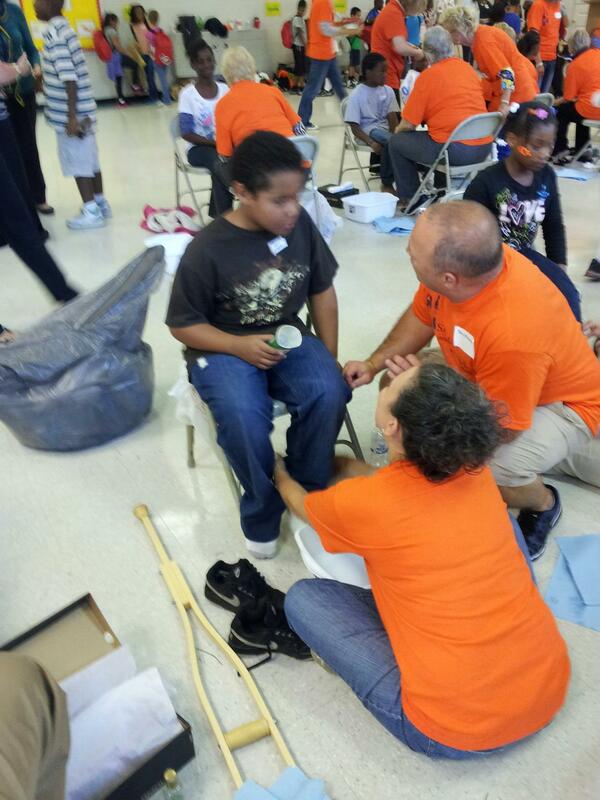 Today, I was once again blessed to participate in a shoe distribution with Samaritan’s Feet. The mission and heartbeat of founder, Manny Ohonme, is 10 million pairs of shoes on the feet of 10 million children in the next 10 years You can read more about Manny’s story of how a simple pair of shoes changed his life and led him to follow what was exampled to him by the love of one who came to serve him. On this day, 400 plus children, teachers, and staff would receive our undivided attention as we spent time getting to know them, focusing our hearts and attentions towards them, washing their feet and providing a new pair of socks and shoes for each one of them. The event was a surprise for the entire school and spear-headed by their caring principal, Rebecca Huffstetler. The day started as usual with the younger children filling our stations. So, precious. Timid. Embarrassed and confused by all these people taking off their old shoes, putting their little feet in cold water, washing them and putting new shoes on their feet. Refreshing, but in time the older children would fill the chairs and their disbelief was often verbalized. My breath-taking and life-joy moment happened near the end of the day when a less than thrilled tough 5th grade boy sat down in front of me. What would become my favorite conversation of the day began with, “So, lady, how much are they paying you to wash my feet, be nice to me and give me this new pair of shoes?” And with attitude and no smile, I might add. He was not rude. Simple putting it all on the table and in all likelihood, wanting to call me out and say, yep, told you so, they don’t care about me. I continued as the Holy Spirit kicked my heart into gear and shared the gospel message of hope, a future, and of surrendering his heart to receive the free gift of life now and eternal through Jesus Christ. The promise of forgiveness, new life and God’s perfect plan for his life. You see, we get moments like these on occasion and I felt the urgency to seize the moment while it was sill today! I continued. “God’s plan for you is perfect. Your story is still being written. 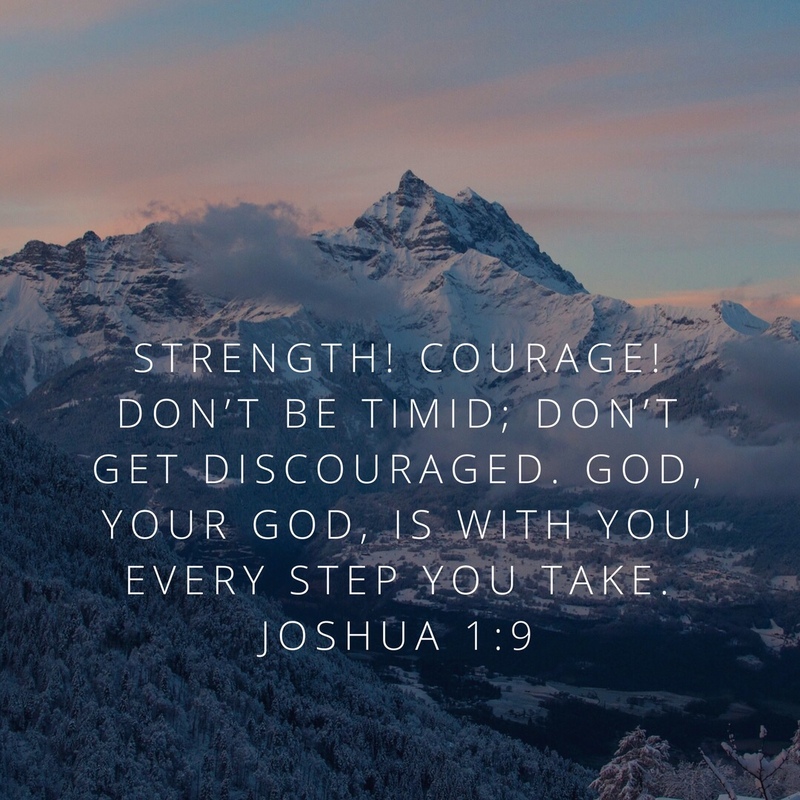 When you want to give up or you struggle, think of the silly lady who said, you can do it through complete surrender of your heart to the Lord and the power of God which is greater than your mind can conceive.” God wants you to know that you matter and that He has a plan for your life!! An, sweet friend, I pray for you, I will claim each step for the rest of your days for God to do “exceedingly, abundantly in your life above all that you can ask or think.” HE IS ABLE!!! He sheepishly, smiled. I said there is just one more thing. “Can I get a hug?” I have yet in my life until today, felt a more genuine embrace than from his big ole size 10 men’s shoe bear hug that I received from Gods most precious possession. You see, God spoke directly to his heart today. The Holy Spirit penetrated the deepest part of this young mans soul and there is no doubt in my mind that the God of the universe will make good on a prayer prayed forward for a life in the balance between the god of this world and our heavenly Father’s will for his life. So, when you wonder if God still uses the smallest of opportunities for His good and His glory, remember the hardened heart of my friend today. And when you pray, you need not know his name but that his heavenly Father is well acquainted with the matters of his precious heart and life. Next time you think, I should do something to help….just do it. Don’t wait. The true blessing will be yours. And when you wonder, does God really still open hearts in the least imaginable ways….like through a pair of shoes, a smile, a hug, a word of affirmation, a touch or a smile? May you see my face smiling back at you and saying….Oh yes He does!! Remember, Jesus said it best….”My concern is holiness…” May we walk simply on this path of righteous living….and trust God for life-changing results! For His glory! Amen and Amen!